Your iPhone SE is an impressive device that’s capable of playing games, running apps, writing word documents, and performing many different functions that can keep you entertained and help you solve problems. But it’s also a phone, and you can place calls in a variety of different manners. But if you need to manually enter a phone number on your iPhone SE and you’ve never had to do it before, then you might be struggling with how to do so. Our tutorial below will show you where to find the keypad on the iPhone SE so that you can enter a number and manually place a call to a phone number. The steps in this article were performed on an iPhone SE in iOS 10.3.2, but will also work for other phone models using the same version of iOS, as well as most other iPhone models in most other versions of iOS. Step 2: Select the Keypad tab at the bottom of the screen. Step 3: Enter the phone number that you wish to call (the number will appear at the top of the screen as you enter it) then press the green call button. 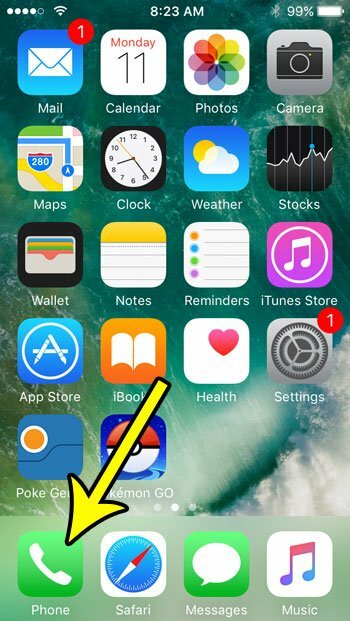 Now that you know how to make a phone call on your iPhone, you might be interested in doing other things, like sending an email. This article will show you how to compose and send an email directly from your device after you have added your email account.